Twitter continues to grow and draw in new users, but a new report from eMarketer suggests the boom may be coming to an end. Year after year Twitter’s growth is slowing down, and it looks like the trend will continue for the foreseeable future. As eMarketer reports in their first-ever forecast of global Twitter users, Twitter’s user base will increase by 24.4% in 2014. If this is proven true at the end of the year, it will continue the pattern that has already been taking place for the past few years. In 2015, it is predicted Twitter’s growth rate could drop to just 9%. In 2013, Twitter grew by 30%, and 2012 saw a 50% rate of growth. The majority of recent growth has come from overseas. If eMarketer’s estimates are correct, it would put Twitter at a total of 227.5 million users this year, and 269.9 million in 2015. Our figures differ from Twitter’s reported figure of 255 million monthly active users in 2013 because we rely heavily on consumer data to weed out business accounts, multiple accounts for individual users, and other sources of potential double-counting. These numbers paint a grim picture for Twitter, who has already admitted its trouble with retaining users, especially as Wall Street becomes increasingly disappointed in Twitter’s slow user growth. Every month, comScore releases a “U.S. Search Engine Rankings” report illustrating the market shares of the most commonly used search engines. From month to month the results have stayed largely the same for over a year, with Google taking in almost exactly two-thirds of the market and the other search engines like Bing and Yahoo slowly growing and shrinking by minuscule percentages. For such an obvious attack on another analytics firm, you would assume Conductor was publishing new information or even comparing the same factors. As Danny Sullivan from Search Engine Land shows in his article reviewing Conductor’s findings however, Conductor’s findings shouldn’t be news to anyone paying attention, and they don’t disprove comScore’s findings. The issue i that, when people hear that Google controls two-thirds of the search market many publishers assume they should see close to the same proportion of traffic coming from the search engine. Instead, most publishers see significantly more traffic from Google than their market score seemingly indicates.But, market share isn’t a measurement of the traffic sites receive. 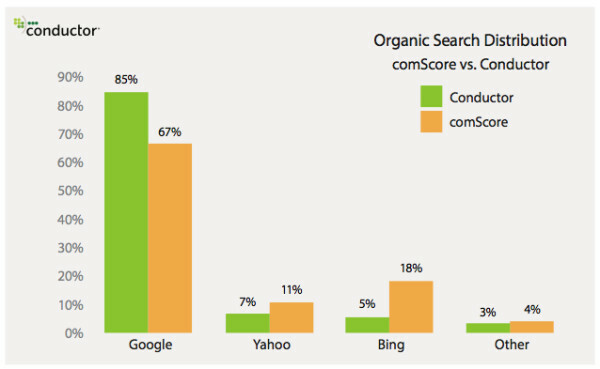 The monthly report from comScore reflects the number of actual searches conducted from the major search engines. Most importantly, their report isn’t affected by where the user goes after clicking on a search listing. Sullivan refers to this type of measurement as “before-the-click” behavior. Every search gets counted equally, no matter what the destination is. Conductor’s analysis instead focuses on “post-click” behavior, or the traffic publishers receive from search engines. 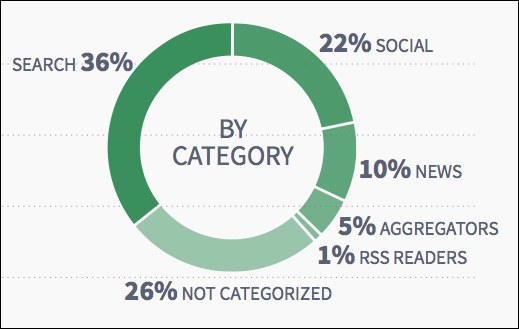 In their report, the information that matters most is the post-click activity. If someone does a search and clicks on a link that leads them back into the search engine, it isn’t measured in Conductor’s report. Search engines with the largest gaps favor their own services more than others, which would suggest that Bing’s 13% gap indicates they direct searchers to their own services and platforms more than any other search engine. Surprisingly, Google appears to favor themselves the least, with a -18% gap. Of course, there is always the possibility that this gap could be created or exacerbated by other factors that may not have been in play at the time. When Sullivan asked comScore for its opinion on the difference between its reports and Conductor’s recent study he was told mobile search could also potentially be an influence. Google has a higher share of mobile search than compared to desktop figures, and comScore’s reports only include data from desktop users. Both reports serve their own purposes, but both also highlight the same issue. Google has a huge hold on search traffic that should be recognized and planned for. But, those who buy into Conductor’s study may be tempted to ignore the other search engines entirely. To each their own, but my opinion still favors an approach which puts the most weight in Google but doesn’t cut out the other search engines too much. Despite all the advances and changes in online marketing in recent years, email marketing is still one of the most valuable tools any business or marketer has at their disposal. It is so effective that up to 66% of online consumers have reported making a purchase just because of an email marketing message. To highlight the importance of email marketing, digital marketing agency Fathom created an infographic complete with a 6 step guide to email marketing, 7 ways to improve your emails, and even a few interesting facts. If you’ve been neglecting your email marketing in favor of social media or content creation, you’re hurting yourself as much as you are helping. The newer platforms for online marketing can be very effective and useful, but sometimes the traditional methods stay popular for a reason. Email marketing is powerful and won’t be going anywhere anytime soon. It’d be best not to cast it out before it loses its effect. With the constant stream of information coming out of the online marketing industry, it can be hard to keep up with all the latest updates without missing some important news. That’s why we compile all the biggest stories you may have missed this week all in one convenient place every Friday. This week was short on big announcements from most of the major platforms (aside from Panda 4.0), but there are still plenty of small updates you might not have heard yet. Restaurants who are taking advantage of their Facebook profiles may have noticed a new feature yesterday, which will make it easier than ever to make their menus available to the general public. Facebook pages associated with restaurants can now upload PDF versions of their menus and display them directly in their page tabs. The feature is available worldwide within page settings. Yesterday, Facebook announced some changes to their privacy systems that are intended to raise the ease of controlling how secretive you are with what you share to their site. 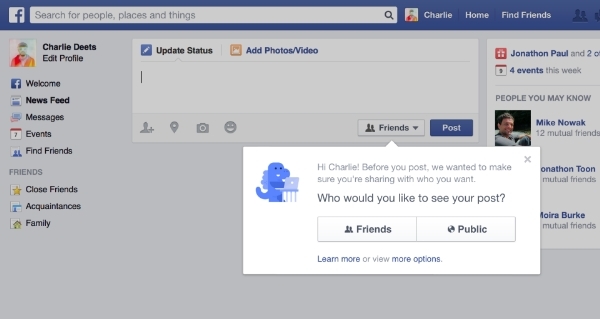 The most notable change is that posts are now set to only be shown to friends for new users. Previously, the default setting was Public. Facebook is also working on rolling out a new and improved privacy checkup tool for users over the next few weeks. The tool will walk users through a series of steps to review their privacy settings ranging from who can see their posts to what apps they’ve given permissions to. Facebook has been making efforts to improve the privacy and security of users in the past few months, including introducing Anonymous Login and making it easier for smartphone users to see which audience they are sharing with. 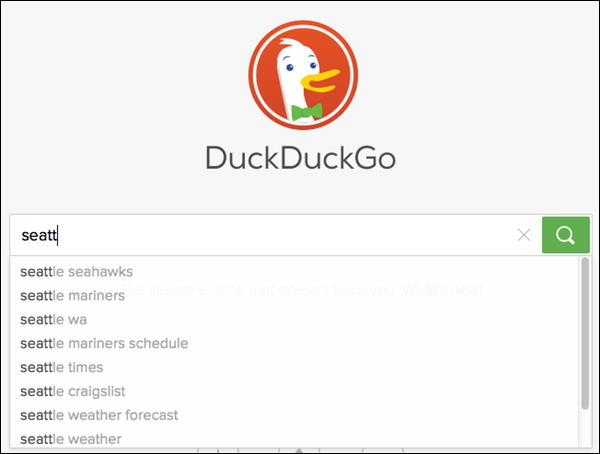 DuckDuckGo made its name as the search engine for those want user privacy in the wake of the NSA scandal that broke open last year, but it always suffered from a rough layout that didn’t favor public usage. All that has changed as the engine relaunched earlier this week with a new look and feel, as well as tons of other new features like maps, local search, and image search. The new layout resembles a traditional search engine much more, while still championing users privacy, and improving on existing features while they’re at it. DuckDuckGo is using OpenStreetMap for its map system. 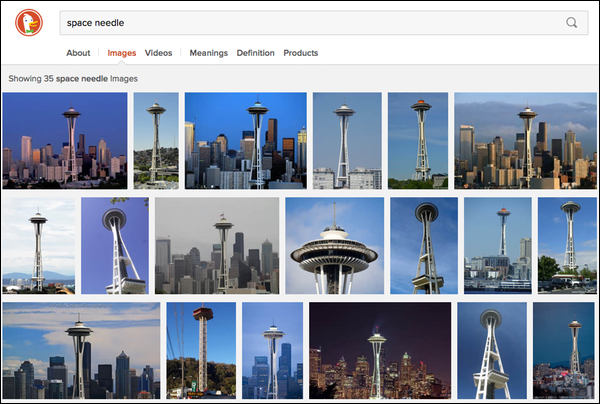 Image search results are shown in a carousel-style presentation by default, but you can also switch to a more familiar full-screen grid with the click of a mouse. Over the past 2 days, the SEO community has received confirmation that Google is rolling out not one, but two web spam focused algorithm updates; Panda 4.0 and Payday Loan 2.0. Panda 4.0 was confirmed by Matt Cutts on Twitter, while Search Engine Land initially announced the newest Payday Loan update which was later verified by Cutts. As with any major algorithm update, there is much more speculation than there are facts at the moment. However we do know a little bit about the roll outs of the algorithm updates and what they are focused on. Panda 4.0 is being called the ‘softer update’ in relation to its precursor thanks to a discussion back in March. It has been stated that the update affects different language queries to different extents, but Google estimates the effect on English searches is about 7.5% of queries. Considering the reports of sites seeing significant recoveries, it is safe to assume this update is a little more generous and more welcomed than than the previous updates to Panda. The Payday Loan Algorithm is a bit less well known, as it was first launched last June and only targets ‘very spammy queries’; primarily the type of spammy queries associated with payday loans, insurance, and accident claims. So far estimates say only .2% of English queries were affected by this update, though this is also an international rollout affecting different languages to different extents. Any business with a successful marketing system knows the importance of keeping up with the latest trends. If you don’t stay up to date, you can struggle with staying relevant or finding ways to connect with potential customers, which can quickly become a spiral into further irrelevancy. But, it isn’t always easy to stay tuned in with the constant ebb and flow of new trends and competing interests. This has always been the biggest struggle for marketing teams. In the past it took enormous resources to track consumer trends, while now we have so much information on hand it can often be overwhelming. In today’s constantly connected world, marketers and business owners have all the most up-to-date data on the rising trends all available with a simple click of the mouse. Instead of conducting public surveys to see what people are talking about, you can gain a significant amount of insight from checking out Twitter’s trending topics. At the end of the day though, being completely connected with the hottest trending topics of the moment is wasted if you can’t convert that information into an opportunity to connect with your audience. The trends present an opening that you have to take advantage of. Eric Sornoso’s recent article from Search Engine Journal teaches business owners how to spot their opportunity and strike when the right trends appear. With a little bit of trial and error, you’ll learn Twitter’s constantly changing trends present endless chances to get your name recognized. Last fall, Pinterest announced they would be making their first foray into paid ads on the social media platform under the title of “Promoted Pins”. They ran some tests shortly after the announcement to gauge how their users responded to the ads. 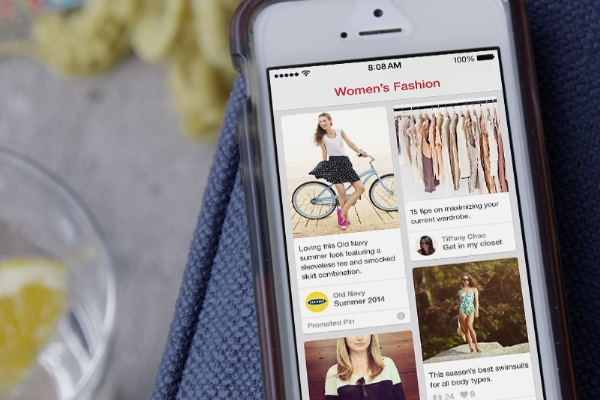 Now, Pinterest declared they have officially begun a small paid test of the Promoted Pins while working with a small group of brands from the U.S. The test will only be shown in Pinterest’s search and category fields. Pinterest lists the entire list of brands taking part in the test, including ABC Family, Banana Republic, GAP, and Walt Disney Parks and Resorts. If you do happen to catch one of the Promoted Pins being tested, Pinterest would like users to give feedback via a form found here. Just about every social media platform has their own mini-trends that influence what type of content gets shared the most at a certain time. Facebook users follow predictable patterns of usage times and the success of content on Reddit is partially decided by the “prime sharing times” when users are more likely to see new content. 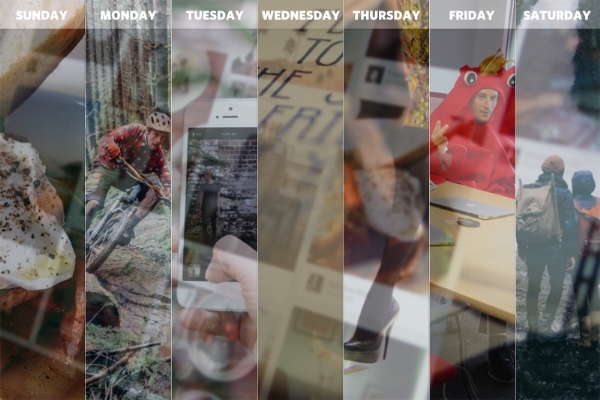 Similarly, Pinterest recently shared a post on their blog detailing the most popular categories for each day of the week. 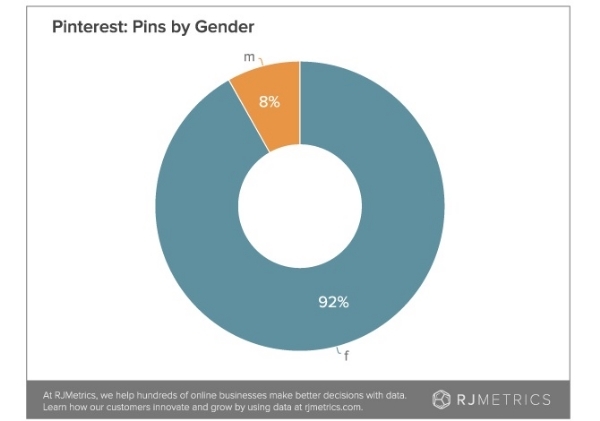 On the topic of Pinterest trends and data, RJMetrics recently ran a study of 50,000 random pinners and their pins to analyze how people are using Pinterest. At first glance, the data may seem like old news, however the details found in the study give strong insight into what pinners are interested in, what they are likely to share, and when they are most likely to Pin. For example, it is no secret that the majority of Pinterest’s users are female, but it may come as a surprise that around 80 percent of pinners are female, and an whopping 92 percent of all pins on the site come from women. You can get all the details from the study in RJMetrics’ report on their site. Yesterday, Google announced via Google+ that they have added a new section on map results for location searches named “Quick Facts.” As many have pointed out, the section looks quite similar to the Knowledge Graph that appears on some Google searches, and has the same type of very quick information about the area you are searching for. The Quick Facts are pulled from Wikipedia and other data sources typically used in the Google Knowledge Graph. 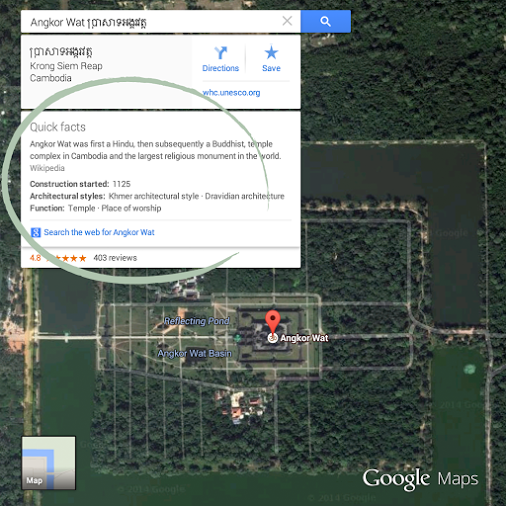 You can get an idea how the Quick Facts operate thanks to the example Google released of the results for Angkor Wat in Cambodia below. Earlier this week, Twitter revealed they will be adding a new feature for its iPhone and Android apps, as well as Twitter.com, which allows users to mute specific people and forbid their tweets from appearing in your timeline. You can mute users two different ways. You can either mute a user from a Tweet by clicking on ‘more’ followed by ‘mute @username’ or you can mute users from their profile page. When a user is muted, their Tweets and Retweets will be no longer visible in your home timeline and you won’t receive push notifications if you previously set up that feature for the user. However, the muted user will still be able to see, face, reply to, and retweet anything you share. From the muted users perspective nothing will have changed. You will be able to unmute users at any time and the new feature is expected to be rolled out in the next few weeks. 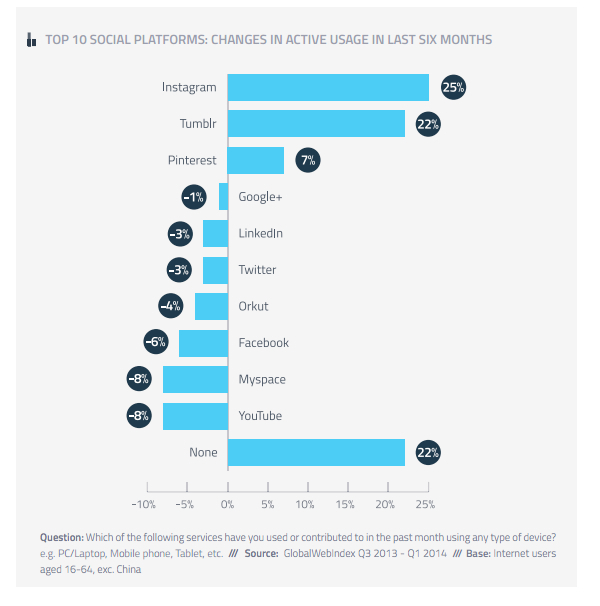 Facebook and Twitter still hold a strong hand on the social media landscape/ However their grasp may not be safe forever as new survey data from GlobalWebIndex shows a slight reduction in usage for both networks over the past six months. They Facebook may not be too nervous yet. The survey of more than 40,000 internet users in 32 global markets, excluding China, found that as much as 82% of users worldwide have Facebook accounts. However, several reports suggest the small dip in usage may be an indicator of a growing trend within Facebook, opening the door of opportunity for smaller and more focused social platforms such as Instagram and Tumblr. The survey also found a significant growth in the use of mobile apps. Out of all apps, Snapchat saw the biggest rise in use as it is accepted by more and more teens worldwide. You can download the full report from GlobalWebIndexhere, but Martin Beck also summarizes the findings over on Marketing Land. Google Webmaster Tools (GWT) is Google’s direct line to every website owner, which consequently makes it the most important set of tools and webmaster has at their disposal. GWT allows webmasters to identify any problems with their site including alerting you to any penalties placed on you by the search engine and checking for signs of malware that may have infected your site. Probably the most surprising thing about Google Webmaster Tools is how many webmasters go without ever opening the dashboard of GWT. It isn’t like the cost is keeping them away. Seeing as Google Webmaster Tools is free, the best assumption is that many webmasters stay away from GWT because they are intimidated by the wealth of data and tools all in one place. Simon Heseltine created an extensive overview of Google Webmaster Tools’ features and capabilities, as well as how you can leverage these tools to optimize your site and ensure everything is working as it should be. If you aren’t using Webmaster Tools, you are missing out and your site is likely suffering because of it. Taylor Ball https://www.tulsamarketingonline.com/wp-content/uploads/2018/07/TMO-Logo.png Taylor Ball2014-05-15 12:46:002014-05-15 12:46:00What is Google Webmaster Tools? SEO and online marketing have changed drastically over just the past couple years, especially with the rise of social media and huge changes to how search engines are able to analyze and rate websites for users. However, some things have stayed the same through it all, such as the importance of email marketing. It could be easy to think that social media would usurp the place of email marketing in building a relationship between consumers and your brand by gradually letting potential customers see who you are and what you represent. However, you would be wrong as emails still hold their place by offering a direct line to interested users that even social media can’t match. The majority of businesses realize this, judging by the continued prevalence of email signups and calls-to-action deliberately designed to get visitors onto an email list. What some of those companies may not understand is that they may be missing out on some of the potential of their email list by marketing to the wrong device. 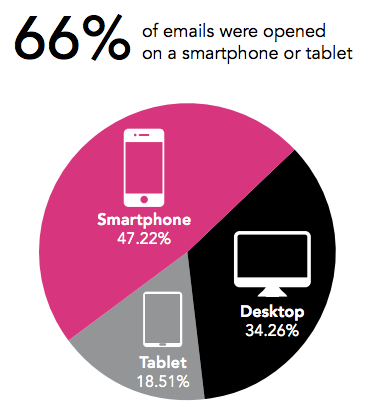 A new report from Movable Ink’s Q1 2014 US Consumer Device Preference Report shows that email opens are continuing to migrate away from desktop to tablets and smartphones. At this point, desktop opens are actually the minority compared to mobile devices. Greg Sterling has an analysis of the data from the report, but to me the findings show that a large amount of email marketing is missing the mark by targeting users sitting at a desktop computer browsing through a day’s worth of email. This may have been the norm a few years ago, but today the majority of emails are opened while out and about and emails should be designed to fit this purpose and be able to catch users’ attention from the smaller screen. You can start making your email marketing strategy more mobile friendly by making your emails explicitly mobile friendly as well as the associated landing pages these emails direct to. In a day-and-age when the majority of people are checking their emails and doing browsing from smartphones there is no excuse to be sending users emails they can’t easily view or sending users to landing pages that require non-iPhone friendly Flash plug-ins. Search engines and social media are battling for the top spot as the leading source of referral traffic to publishers on the web. Recent accounts suggested that social media may be taking the lead. However new data from Parse.ly, a content analytics platform that counts Reuters, Mashable, Slate, and The Next Web among its many clients, shows that search has retaken the lead from social media as the top source of referral traffic in March of this year. Parse.ly’s publishers saw 32.8 percent of its traffic coming from search in March, compared to 31.2 percent from social media. That is the exact reverse of results from data, when data showed social traffic outdid search 32 to 30 percent. 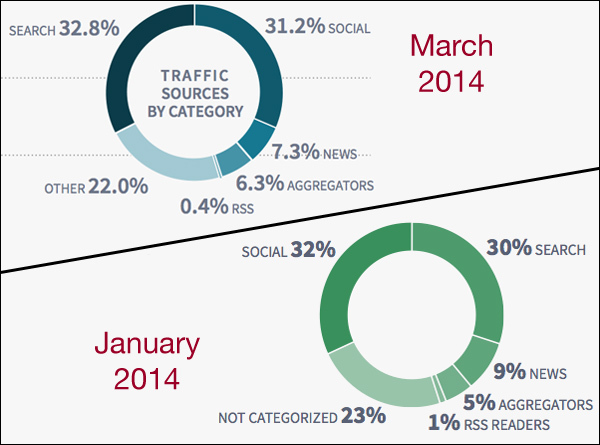 Overall the trends still favor social media, despite the good month for search in March. If you look at reports from further back, it becomes clear that search has been steadily losing ground. In October 2013, Parse.ly reported search was by far the dominant source of traffic at 36 percent, compared to only 22 percent for social. Google sites were still the No. 1 overall source of traffic for the analytics platform’s clients during the most recent reporting period, with Facebook coming in second. Those two net giants were significantly higher sources than any other individual sites.